Name Variation Lemuel Winston Hood was also known as Lem W.
Name Variation Lemuel Winston Hood was also known as Samuel W.
Lemuel Winston Hood was born on 27 June 1848 at Pennsylvania. Lemuel Winston Hood married Eliza Ann Seiders, daughter of Joseph Seiders and Catherine Elizabeth Kiefer, circa 1872. Lemuel Winston Hood died on 7 June 1922 at age 73. [S247] U.S. Federal Census 1870 U.S. Federal Census, by Ancestry.com, Page 13. Stamp 234. Dwelling 32. [S245] U.S. Federal Census 1900 U.S. Federal Census, by Ancestry.com, ED145. Dwelling 20. [S244] U.S. Federal Census 1910 U.S. Federal Census, by Ancestry.com, ED126. Dwelling 24. [S243] U.S. Federal Census 1920 U.S. Federal Census, by Ancestry.com, ED178. Dwelling 50. Samuel Blair Hood was born in 1812 at Pennsylvania. He was the son of (?) Hood. Samuel Blair Hood married Sarah Jane Miller circa 1835. Samuel Blair Hood was buried in 1894 at Spring Green Cemetery, Spring Green, Sauk, Wisconsin. [S246] U.S. Federal Census 1880 U.S. Federal Census, by Ancestry.com, NA Film Number T9-1446 Page Number 231A. Name Variation Sarah Jane Miller was also known as Jane. Married Name circa 1835 As of circa 1835,her married name was Hood. Sarah Jane Miller was born in November 1816 at Pennsylvania. 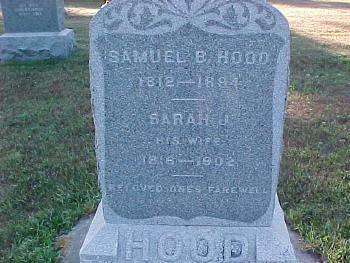 She married Samuel Blair Hood, son of (?) Hood, circa 1835. She was buried after 30 July 1902 at Spring Green Cemetery, Spring Green, Sauk, Wisconsin. Sarah Jane Miller had 6 with 2 (not) living in 1900 children. [S6] Wisconsin, Wisconsin Vital Record to 1907, Vol 02 Reel 121. [S245] U.S. Federal Census 1900 U.S. Federal Census, by Ancestry.com, ED145. Dwelling 12. Name Variation Lillian Ione Hood was also known as Lily Ione. Married Name circa 1898 As of circa 1898,her married name was Runyan. Lillian Ione Hood was born in 1873 at Wisconsin also reported as Iowa. She was the daughter of Lemuel Winston Hood and Eliza Ann Seiders. Lillian Ione Hood married Harry Arthur Runyan circa 1898. Lillian Ione Hood died on 27 August 1950 at Spring Green, Sauk, Wisconsin. Lillian Ione Hood had 5 with 5 living in 1910 children. Name Variation Edward Guy Hood was also known as Ed J. Name Variation Edward Guy Hood was also known as Eddie. He was the son of Lemuel Winston Hood and Eliza Ann Seiders. Edward Guy Hood married Ellen (?) circa 1902. Edward Guy Hood died in 1946. Edward Guy Hood was educated in 1940 at through 4 years of high school. [S6] Wisconsin, Wisconsin Vital Record to 1907, Reel D0005 Record 012253. Carl James Hood was born on 23 December 1881 at Spring Green, Sauk, Wisconsin, also reported as Dec 1882. Carl James Hood married Lettie E. Steltz on 23 December 1916 at Kittitas, Washington. Carl James Hood died on 25 May 1941 at Seattle, King, Washington, at age 59. Name Variation Donald Leroy Hood was also known as Roland L.
Name Variation Donald Leroy Hood was also known as Roy. Donald Leroy Hood married Matilda Ruel, daughter of Julius W. Ruel and Bertha Sehler. Donald Leroy Hood was born on 21 February 1889 at Wisconsin. Donald Leroy Hood died on 10 May 1958 at Alameda, California, at age 69. Name Variation Hester S. Hood was also known as Esther. Name Variation Hester S. Hood was also known as Hester H.
Hester S. Hood was born on 6 November 1850 at Pennsylvania. She was the daughter of Samuel Blair Hood and Sarah Jane Miller. Hester S. Hood died on 17 August 1938 at age 87. 1 June 1905 Spring Green, Sauk, Wisconsin She appeared on the census of 1 June 1905 in the household of Mary Ann Seiders at Spring Green, Sauk, Wisconsin. Sergeant Joseph M. Hood was born on 4 December 1837 at Butler, Pennsylvania. Sergeant Joseph M. Hood married Mary Ann Seiders, daughter of Joseph Seiders and Catherine Elizabeth Kiefer, before 1860. [S6] Wisconsin, Wisconsin Vital Record to 1907, Vol 01 Reel 120. [S180] Wisconsin Sauk Co Cemetery Records Vol 6, page 84. [S248] U.S. Federal Census 1860 U.S. Federal Census, by Ancestry.com, Page 125. Dwelling 947. [S247] U.S. Federal Census 1870 U.S. Federal Census, by Ancestry.com, Page 13. Stamp 234. Dwelling 30. 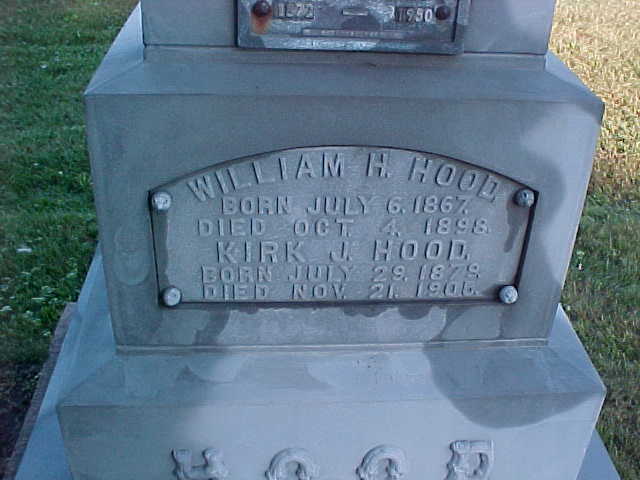 William H. Hood was born on 6 July 1867 at Wisconsin. He was the son of Sergeant Joseph M. Hood and Mary Ann Seiders. William H. Hood died on 4 October 1898 at age 31. He was buried after 4 October 1898 at Spring Green Cemetery, Spring Green, Sauk, Wisconsin, brothers. Kirk J. Hood was born on 29 July 1879 at Wisconsin also reported as July 1878. Kirk J. 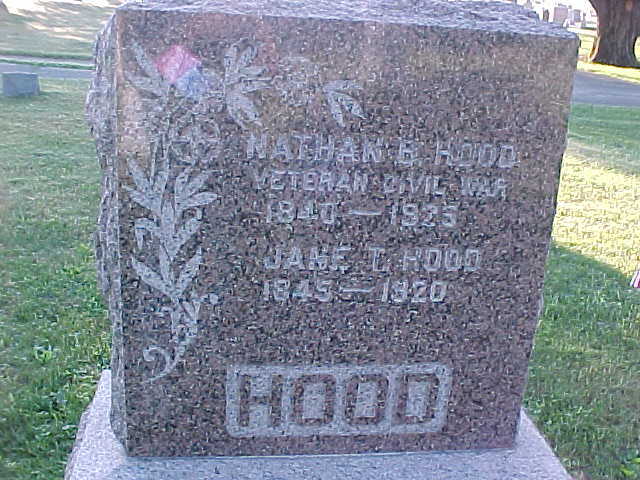 Hood died on 21 November 1905 at age 26. He was buried after 21 November 1905 at Spring Green Cemetery, Spring Green, Sauk, Wisconsin, brothers. [S245] U.S. Federal Census 1900 U.S. Federal Census, by Ancestry.com, ED145. Dwelling 13. George V. Hood was born in 1872 at Wisconsin. George V. Hood died in 1950. Elona Hood was born circa September 1865. Elona Hood died in August 1866 11m. May Hood was born in 1875 at Spring Green, Sauk, Wisconsin. May Hood died in December 1876 at Spring Green, Sauk, Wisconsin. 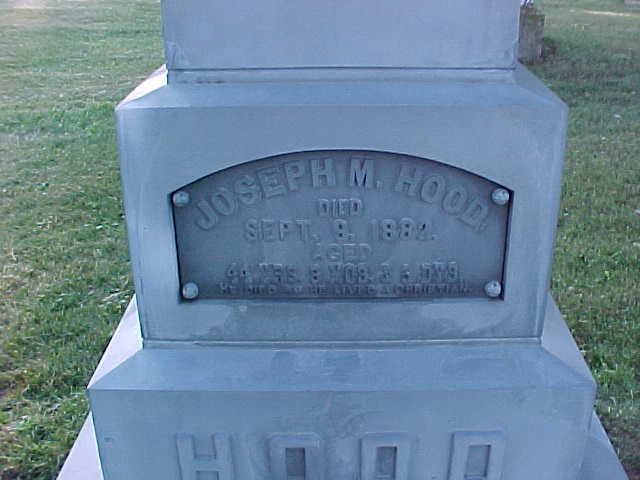 Name Variation Joseph Hood was also known as Josie. Joseph Hood was born on 28 August 1882 at Spring Green, Sauk, Wisconsin. He died in August 1882 at Spring Green, Sauk, Wisconsin. Name Variation Jay Bee Hood was also known as Jay Blair. Name Variation Jay Bee Hood was also known as J. B.
Jay Bee Hood was born on 18 December 1876 at Wisconsin also reported as 18 Dec 1877. Jay Bee Hood married Cynthia A. Hansen circa 1907. Jay Bee Hood died on 12 December 1968 at age 91. [S250] U.S. Federal Census 1930 U.S. Federal Census, by Ancestry.com, ED56-34. Dwelling 76. Married Name Her married name was Webber. Name Variation Marcia E. Hood was also known as Marshie E.
Marcia E. Hood married James W. Webber. Marcia E. Hood was born in 1874 at Wisconsin. Marcia E. Hood died in 1971. Name Variation Jacob Jesse Hood was also known as Kent. Name Variation Jacob Jesse Hood was also known as J. J.
Jacob Jesse Hood was born on 11 February 1870 at Spring Green, Sauk, Wisconsin. Jacob Jesse Hood married Dr. Addie Celeste Clark before 1910. Jacob Jesse Hood died on 29 May 1943 at Cook, Illinois, at age 73. 1 June 1905 Spring Green, Sauk, Wisconsin He appeared on the census of 1 June 1905 in the household of Mary Ann Seiders at Spring Green, Sauk, Wisconsin. [S245] U.S. Federal Census 1900 U.S. Federal Census, by Ancestry.com, ED372. Dwelling 53. [S243] U.S. Federal Census 1920 U.S. Federal Census, by Ancestry.com, ED54. Dwelling 5. Dr. Thomas Henry Hood married Eva M. Dickson. Dr. Thomas Henry Hood was born on 4 September 1862 at Wisconsin. Dr. Thomas Henry Hood died in May 1948 at age 85. Name Variation Eliza Jane Hood was also known as Lida. Eliza Jane Hood married Nelson Harris Scott. Eliza Jane Hood was born circa June 1860 at Spring Green, Sauk, Wisconsin. Eliza Jane Hood died on 29 June 1953. She was buried after 29 June 1953 at Greenhill Cemetery, Laramie, Albany, Wyoming. Name Variation Mehitabel Sweet was also known as Mahitabel. Name Variation Mehitabel Sweet was also known as M.
Married Name circa 1860 As of circa 1860,her married name was Hood. Mehitabel Sweet was born in 1836 at Ontario, Canada. She was the daughter of Abijah Sweet and Mariah Rhodes. Mehitabel Sweet married Nathan Brown Hood, son of Samuel Blair Hood and Sarah Jane Miller, circa 1860 at first marriage for him. Mehitabel Sweet died on 31 December 1862. [S249] U.S. Federal Census 1850 U.S. Federal Census, by Ancestry.com, Handwritten number 232. Dwelling 1000. Sylvester E. Hood was born in 1862 at Wisconsin. He was the son of Nathan Brown Hood and Mehitabel Sweet. Sylvester E. Hood died in March 1882. Name Variation Jane T. Tunnicliff was also known as Jennie T.
Married Name 1 January 1866 As of 1 January 1866,her married name was Hood. Jane T. Tunnicliff was born in May 1845 at New York. She married Nathan Brown Hood, son of Samuel Blair Hood and Sarah Jane Miller, on 1 January 1866 at 2nd marrige for him, Loganville, Sauk, Wisconsin. Jane T. Tunnicliff was buried in 1920 at Spring Green Cemetery, Spring Green, Sauk, Wisconsin. Jane T. Tunnicliff had 9 with 9 living in 1900 children. She had 10 with 10 living in 1910 children. Clarence C. Hood was born in January 1867 at Wisconsin. He was the son of Nathan Brown Hood and Jane T. Tunnicliff. Clarence C. Hood died in 1947. (?) Hood was born at Pennsylvania. Married Name Her married name was Ripley. Name Variation Caroline Elizabeth Hood was also known as Elizabeth. Caroline Elizabeth Hood married Lewis B. Ripley. Caroline Elizabeth Hood was born in 1845 at Pennsylvania. Caroline Elizabeth Hood died in 1926. Victor V. Hood was born circa 1870 at Wisconsin. As of 1910, Victor V. Hood was never married. Name Variation Eliza Ellen Hood was also known as Ella. Name Variation Eliza Ellen Hood was also known as Ellen. Eliza Ellen Hood was born in November 1871 at Wisconsin. She was the daughter of Nathan Brown Hood and Jane T. Tunnicliff. As of 1930, Eliza Ellen Hood was never married. Eliza Ellen Hood was a public school teacher in 1930. [S250] U.S. Federal Census 1930 U.S. Federal Census, by Ancestry.com, ED7. Dwelling 43. Married Name Her married name was Warren. Name Variation Adeline A. Hood was also known as Adda A. Name Variation Adeline A. Hood was also known as Ada. Name Variation Adeline A. Hood was also known as Addie A.
Adeline A. Hood was born in July 1874 at Wisconsin. Adeline A. 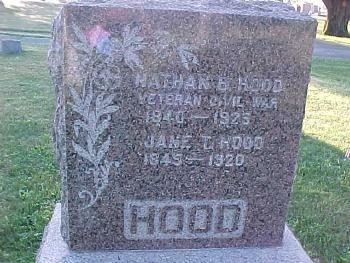 Hood died in 1963. Ralph R. Hood was born in October 1877 at Wisconsin. Ralph R. Hood died circa 1970.